Sunshine and clouds mixed. High 84F. 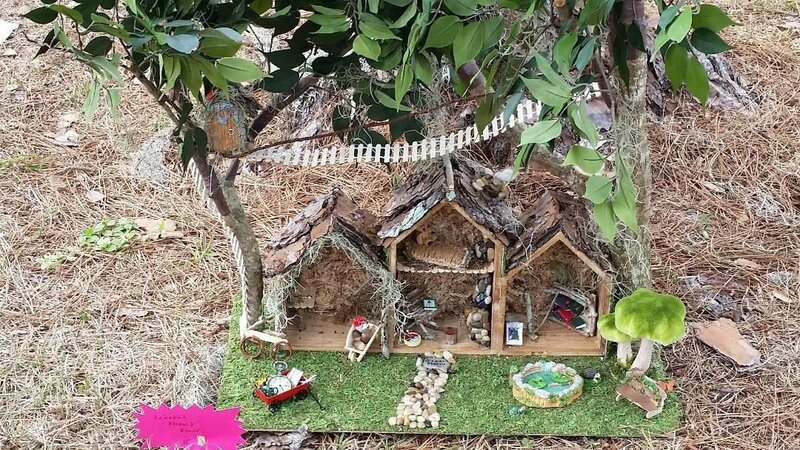 Winds SW at 10 to 15 mph..
Fairy Houses will be displayed throughout Tree Fair 2019 and awarded prizes at the North Port Community Education Center on April 27. Alice White, who has previously been named North Port’s Greenest Citizen, teaches about trees. She is the leader of People for Trees and hosts Tree Fair every year in North Port. NORTH PORT — The annual Tree Fair is set from 10 a.m.-2 p.m. Saturday, April 27, at North Port Community Education Center, 4940 Pan American Blvd. People for Trees has been sponsoring the tree festivals since 1999. People for Trees is a nonprofit native tree advocacy group led by Alice White of North Port. It will be a busy four-hour period for the event. There will be a sale of hundreds of Florida native trees for $15 each. The 3-gallon trees will each stand about 6-8 feet tall and include Florida sweetgum, American elm, bald cypress, slash pine, Southern red cedar, red maple, dahoon holly and pignut hickory, the group said. White will lead informational “walk/talks” about the trees to help attendees choose the right trees for their yards, according to a news release. “Attendees can see the correct way to plant a tree at a demonstration plot and printed planting/watering instructions will be given with every tree purchase,” it said. The day will also include a Fairy Garden led by “Rev. Faerie” Elaine Silver “who will also provide the musical entertainment. Children are invited to wear their best fairy attire,” it stated. The Fairy Garden entertainment begins at 11 a.m.
“Rev. Faerie is an accomplished singer, songwriter, touring and recording artist with 20 CDs to date,” it notes. Also included is the annual Fairy House exhibit/contest. Judging takes place at 1 p.m.; awards are announced at 1:30 p.m.
Also for kids, children will have the opportunity to receive a free 1-gallon pine tree (while supplies last). “Children (ages 12 and under) who take part in the ‘Interactive Tree Walk,’ an outside area where they will discover the many benefits of trees as listed on display boards throughout the area, can take home a free, 1-gallon native slash pine tree so they can grow a tree of their own,” the group said. There is a limit of one per child. People for Trees has existed in North Port since 1997. “Members strive to promote the importance of maintaining and protecting our native tree canopy,” it stated. For more information, contact White 941-468-2486; email treelady12001@yahoo.com or visit www.peoplefor trees.com.